So, what is Tor? Well, put simply it’s the name of a network service that is based on the principles of Onion Routing, a technique for anonymous communication developed by the US Navy. It’s also free and pretty much the de facto standard online anonymity tool. It provides anonymity (not confidentiality) online, which to put it in layman’s terms: people can see what you write, but won’t know it was you who wrote it. It’s not foolproof (I’ll address the shortcomings in detail in part two), however it does provide a damn good curtain against all but the most persistent and well equipped interlopers, and, if used extremely pedantically, could even thwart them. How does it work? 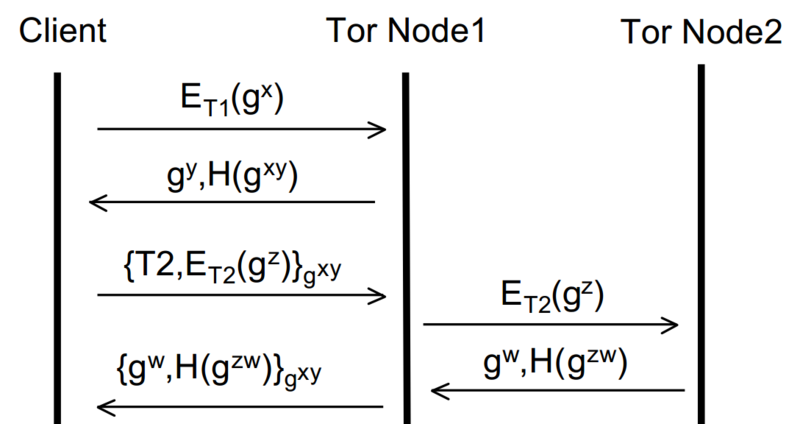 Tor uses Onion Routing, a system of building up a plaintext message in a series of encryption layers such that each layer is sequentially unwrapped by a series of intermediaries (nodes). The original plaintext message is only viewable at most by the sender, the recipient and the final intermediary (the exit node). If there is end to end encryption between the sender and recipient, then not even the exit node can read the message. Asymmetric Cryptography: (aka public key cryptography): Essentially a cryptographic system that uses two keys, public and private. The sender encrypts their message with the recipients public key (which is public), and the recipient decrypts the message using their private key, known only to them. Symmetric Cryptography: The same key is used for both encryption AND decryption. The drawback of symmetric key encryption is distributing the key to both parties. Transport Layer Security: TLS (now superseded by SSL - Secure Sockets Layer) is protocol to provide privacy and data integrity between two communicating applications: it adopts asymmetric cryptography using X.509 certificates for mutual authentication and to establish a symmetric key to encrypt further communication. Diffie-Hellman: Diffie-Hellman is a key-exchange protocol for setting up a secret symmetric key over an insecure channel. Once the key is established, the two parties wishing to communicate can do so with symmetric encryption using the shared key. I’ve actually omitted a few details from this explanation for brevity (noticeably, the intricacies of how traffic passes between Tor nodes via ‘cells’ containing specific instructions). These omissions notwithstanding, however, I think the explanation below is well delivered to grasp the strengths of the underlying mechanics of Tor without being boggled down in small minutiae. If anyone is interested in the whole deal, here is a lengthy explanation on Tor from the Tor project itself: https://svn.torproject.org/svn/projects/design-paper/tor-design.html . 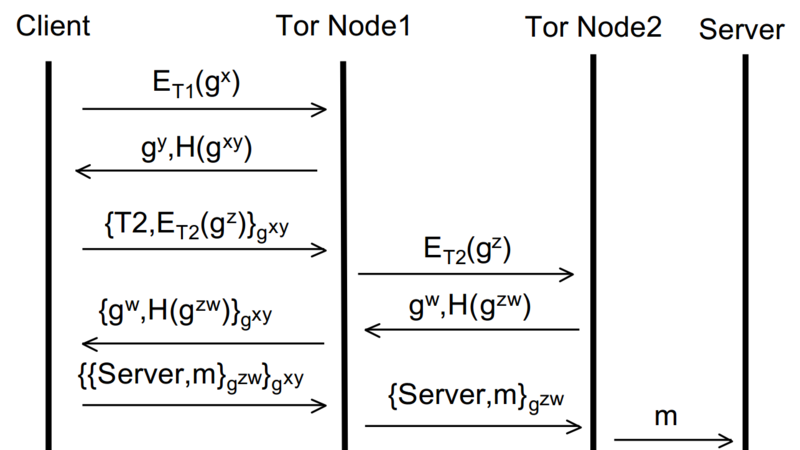 What follows is a simply explained, conceptual overview of how Tor iteratively creates a secure circuit for anonymous communication. I’m going to have to get a bit mathematical hereafter, so bear with me as I’ll try and make everything as easy to understand as possible. Each ‘node’ in the Tor Circuit is called an Onion router. These communicate with one another, and with the user’s Onion Proxy, via TLS. Using TLS conceals the data on the connection with perfect forward secrecy, and prevents an attacker from modifying data on the wire or impersonating a router. Each Onion router maintains a long-term identity key and a short-term onion key; the identity key is used to sign the X.509 TLS certificates and the short-term onion key is used to decrypt requests from users to set up a circuit and negotiate ephemeral session keys. To make a connection via Tor, a circuit between the user’s Onion Proxy and the requested resource is created through a link of Onion routers. The circuit creation process starts by the originator (the user’s Onion Proxy) looking up the public ‘Onion’ key of the first node in the circuit (from a directory) to send it an asymmetrically encrypted message. This message contains the originator’s half of the Diffie-Hellman handshake to be used to establish a symmetric key with which to encrypt further communication (which has significantly less overhead than using asymmetric encryption throughout). 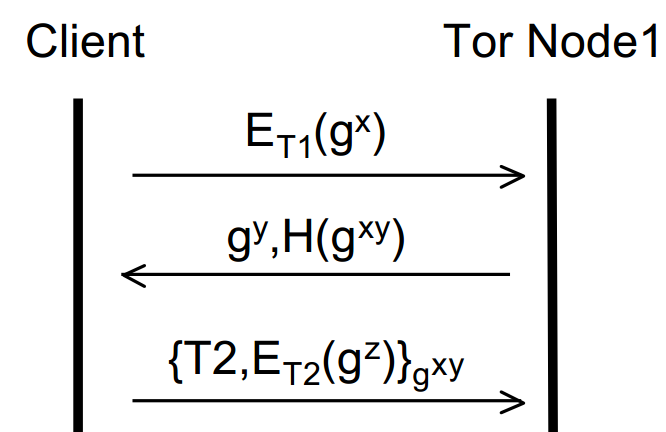 Where ET1 means public key encryption using the Onion key of Tor Node 1, gx/ gy are the respective halves of the DH handshake and H(gxy) is the hash of the shared secret key. 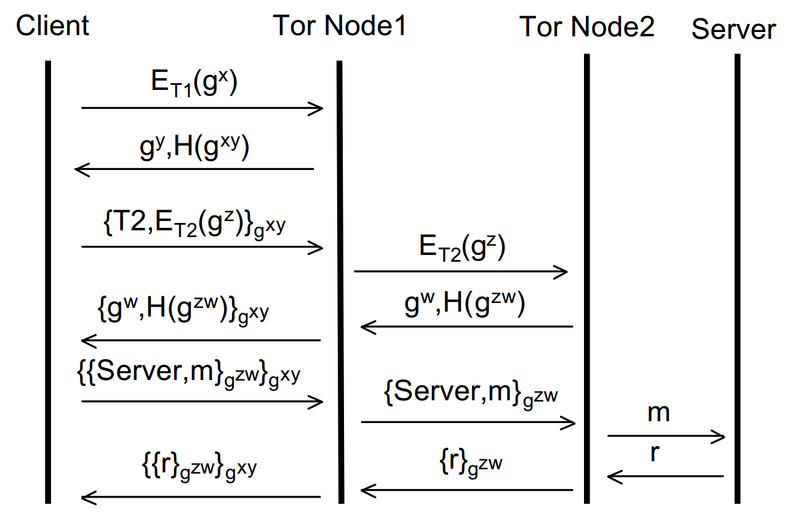 Where T2 is the instruction to talk to Node 2, ET2 is the Onion key of Node 2 and gz is the originators half of the DH handshake to establish the session key with Node 2. Now the originator has two session keys, gxy and gzw – he or she is thus able to apply two layers of encryption one on top of the other – hence the name Onion Routing! This process could in theory be repeated ad infinitum and more and more nodes added to the circuit. However, for brevity, let’s assume that we’re happy with a circuit of size two. We’re now ready to send data over the interwebs anonymously! Say we wanted to open a website (via a HTTP GET request). We’d encrypt the message first with the session key between (originator + Node 2) and then encrypt that entire thing with the session key between (originator + Node 1). So there we have the underlying mechanics of Onion Routing, on which Tor is founded. Hopefully this has led to a good understanding (from a conceptual point of view) of how it works to provide anonymity over a network (read: the internet). Now we’ve got the overview down, we can start to look at some ways that individuals can still be de-anonymized whilst using Tor and how one can prevent against that. That’s all in part two.